Dry, rough or cracked paw pads can be irritating or even painful for your pup, but you can keep him in the pink by rubbing his pads with moisturizing agents and keeping his feet protected from indoor and outdoor irritants. Even though dog paw pads are meant to be tough and sturdy, they can still get dry or damaged, especially if your pup is outdoors a lot, or runs and plays on rough surfaces. 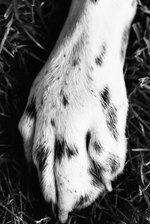 Indoor and outdoor irritants, like lawn and cleaning chemicals, can also dry paw pads. Additionally, trauma and injury can lead to excessive foot-licking, which can dry out pads. If paw pads get cracked, they can become infected, which may require veterinary intervention and antibiotic treatment. Many pet supply stores carry commercial moisturizing agents designed to keep your dog's paw pads soft. You can also use home remedies to achieve the same outcome. Both petroleum jelly and coconut oil, massaged into foot pads, are moisturizing agents that absorb quickly and restore suppleness to skin. Your dog may be tempted to lick -- cover his feet with dog booties or distract him with a chew toy to let the substance soak in. Prevent dryness by putting booties on your dog in cold weather and avoiding hot surfaces in warm temps. Dry off wet dog feet and wash away the residue of rock salt or lawn chemicals that could irritate and dry out pads quickly. Conduct regular foot inspections to make sure your dog's dogs are in top shape.